Green Back Packers star Aaron Rodgers surpassed New England Patriots great Tom Brady as he made NFL history. 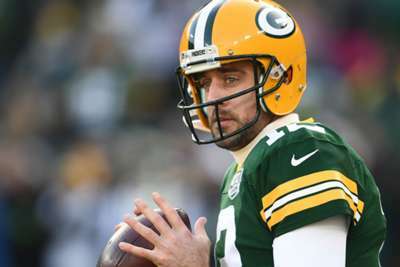 Packers quarterback Rodgers – a two-time MVP –eclipsed counterpart Brady for the most passes without an interception in Green Bay's 34-20 win over the Atlanta Falcons. Rodgers' 359th consecutive pass without an interception resulted in a 24-yard touchdown to Randall Cobb to put the Packers up 27-7 in the third quarter on Sunday. But, the 35-year-old's feat was nearly spoiled against a struggling Falcons' pass defense. Rodgers was almost picked off by linebacker Deion Jones, however Jones dropped the ball and the former successfully fired off multiple passes to top Brady's record of 358. Rodgers' last interception was in week four against the Buffalo Bills on a twice-deflected pass — it was his only pick of the season. He finished Sunday completing 21-of-32 passes for 196 yards and two touchdowns.